Among the ruling interests in the US, one interest even more powerful than the Israel Lobby -- the Deep State of the military/security complex -- there is enormous fear that an uncontrollable President Trump at the upcoming Putin/Trump summit will make an agreement that will bring to an end the demonizing of Russia that serves to protect the enormous budget and power of the military-security complex. You can see the Deep State's fear in the editorials that the Deep State handed to the Washington Post (June 29) and New York Times (June 29), two of the Deep State's megaphones, but no longer believed by the vast majority of the American people. The two editorials share the same points and phrases. They repeat the disproven lies about Russia as if blatant, obvious lies are hard facts. Both accuse President Trump of "kowtowing to the Kremlin." Kowtowing, of course, is not a Donald Trump characteristic. But once again, fact doesn't get in the way of the propaganda spewed by the WaPo and NYT, two megaphones of Deep State lies. The Deep State editorial handed to the WaPo reads: "THE REASONS for the tension between the United States and Russia are well-established. Russia seized Crimea from Ukraine, instigated a war in eastern Ukraine, intervened to save the dictatorship of Syrian President Bashar al-Assad, interfered in the U.S. presidential election campaign to harm Hillary Clinton and help Donald Trump, poisoned a former intelligence officer on British soil and continues to meddle in the elections of other democracies." The WaPo's opening paragraph is a collection of all the blatant lies assembled by the Deep State for its Propaganda Ministry. There have been many books written about the CIA's infiltration of the US media. There is no doubt about it. I remember my orientation as Staff Associate, House Defense Appropriation Subcommittee, when I was informed that the Washington Post is a CIA asset. This was in 1975. Today the Post is owned by a person with government contracts that many believe sustain his front business. And don't forget Udo Ulfkotte, an editor of the Frankfurter Allgemeine Zeitung, who wrote in his best seller, "Bought Journalism," that there was not a significant journalist in Europe who was not on the CIA's payroll. The English language edition of Ulfkotte's book has been suppressed and prevented from publication. The New York Times, which last told the truth in the 1970s when it published the leaked Pentagon Papers and had the fortitude to stand up for its First Amendment rights, repeats the lies about Putin's "seizure of Crimea and attack on Ukraine" along with all the totally unsubstantiated BS about Russia interfering in the US president election and electing Trump, who now kowtows to Putin in order to serve Russia instead of the US. The editorial handed to the NYT insinuates that Trump is a threat to the national security of America and its allies (vassals). The problem, the NYT declares, is that Trump is not listening to his advisors. Shades of President John F. Kennedy, who did not listen to the CIA and Joint Chiefs of Staff about invading Cuba, nuking the Soviet Union, and using the false flag attack on America of the Joint Chiefs' Northwoods Project (look it up online). Is the New York Times setting up Trump for assassination on the grounds that he is lovey-dovey with Russia and sacrificing US national interests? While the Washington Post and New York Times are telling us that if Trump meets with Putin, Trump will sell out US national security, The Saker says that Putin finds himself in a similar box, only it doesn't come from the national-security interest, but from the Russian Fifth Column, the Atlanticist Integrationists whose front man is the Russian Prime Minister Medvedev, who represents the rich Russian elite whose wealth is based on stolen assets during the Yeltsin years enabled by Washington. These elites, The Saker concludes, impose constraints on Putin that put Russian sovereignty at risk. Economically, it is more important to these elites for financial reasons to be part of Washington's empire than to be a sovereign country. I find The Saker's explanation the best I have read of the constraints on Putin that limit his ability to represent Russian national interests. I have often wondered why Putin didn't have the security force round up these Russian traitors and execute them. The answer is that Putin believes in the rule of law, and he knows that Russia's US-financed and -supported Fifth Column cannot be eliminated without bloodshed that is inconsistent with the rule of law. For Putin, the rule of law is as important as Russia. So, Russia hangs in the balance. It is my view that the Russian Fifth Column could care less about the rule of law. They only care about money. 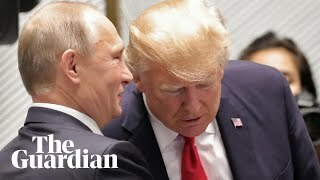 As challenged as Putin might be, Chris Hedges, one of the surviving great American journalists -- who is not always right but when he is, he is incisive -- explains the situation faced by the American people. It is beyond correction. American civil liberties and prosperity appear to be lost. In my opinion, Hedges left-wing leanings caused him to focus on Reagan's rhetoric rather that on Reagan's achievements -- the two greatest of our time -- the end of stagflation, which benefited the American people, and the end of the Cold War, which removed the threat of nuclear war. I think Hedges also does not appreciate Trump's sincerity about normalizing relations with Russia, relations destroyed by the Clinton, George W. Bush, and Obama regimes, and Trump's sincerity about bringing offshored jobs home to American workers. Trump's agenda puts him up against the two most powerful interest groups in the United States. A president willing to take on these powerful groups should be appreciated and supported, as Hedges acknowledges the dispossessed majority do. If I might point out to Chris, whom I admire, it is not like Chris Hedges to align against the choice of the people. How can democracy work if people don't rule?